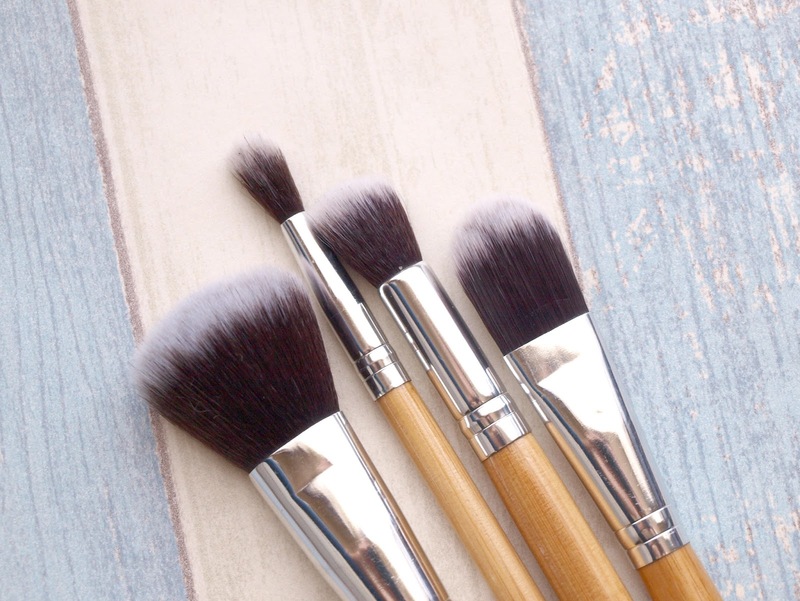 A while ago I reviewed brushes that were on the high end of the spectrum, the Real Techniques Bold Metals Collection, so this time I wanted to present to all of you readers the best and thriftiest option in brushes you can find on eBay. I introduce you to the 11 Piece Bamboo Brush set. This set comes with a tiny kabuki buffer brush, but I got rid of it a while ago because it was too small and impractical for me to use. This also comes with a drawstring pouch made from cotton, making it suitable for travel. 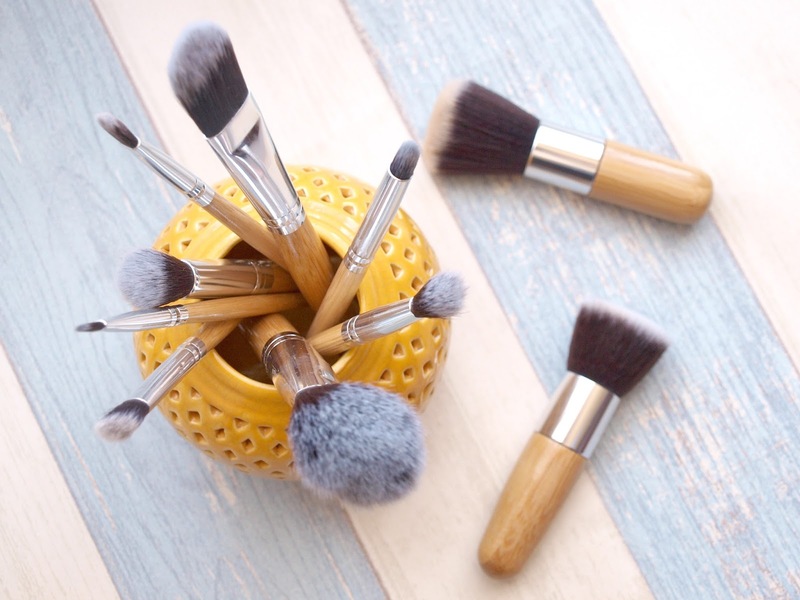 These brushes feature cruelty-free synthetic bristles, environmentally sustainable bamboo handles, and recycled aluminium ferrules. For the measly price of $10.45, though I'm sure you can find this at a cheaper price if you looked hard enough, these brushes are insanely good. I kid you not, these brushes are actually better than my EcoTools brushes, and I use these ones more than I do the Bold Metals. 1. Angled Shadow Brush: I normally use this one to blend my shadow, as it's packed somewhat densely but the bristles aren't stiff or scratchy. It's really quite soft and blends so nicely. It has the added benefit of being amazing at picking up product. 2. Flat Shadow Brush: This one is used to pack on shadow, and it picks up product almost as well as the previous brush. The bristles are soft and smooth, densely packed and stiff enough for packing. It is also remarkably good for applying concealer. 3. Pointed Crease Brush: One of my favourites in this set, it applies shadow into my crease, and I also use it for my bottom eyelid. It's super dense and stiff, but it does not blend as well as the first two brushes I mentioned. 4. Angled Brow Brush: I actually use this one for my cream eyeliner, as this is thin and soft enough for a smooth application with a flick at the end. It's incredibly gentle and doesn't tug at my eyelids. 1. Blush Brush: This is the only blush brush in this set, but let me tell you this, it is really good for a blush brush. It's soft, doesn't tug or scratch at your skin, and picks up product easily. 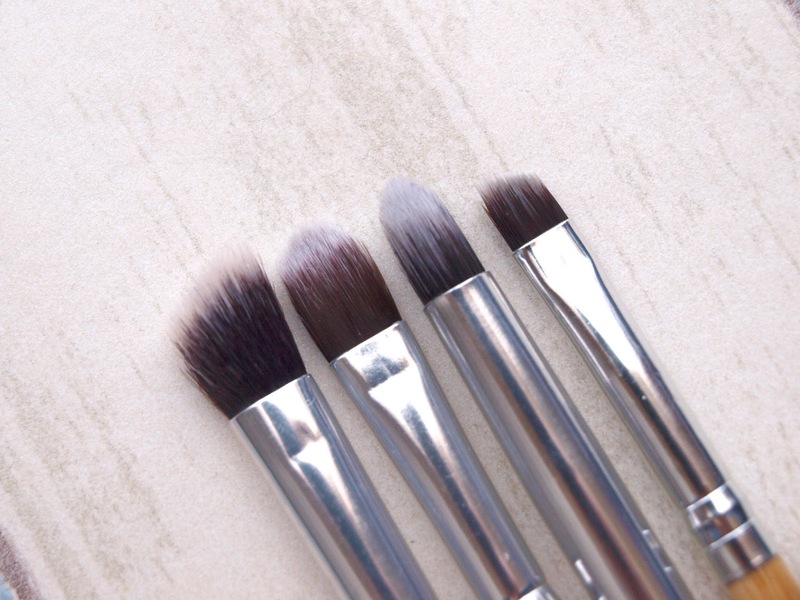 It blends better than the Bold Metals Tapered Blush Brush. 2. Eyeshadow Blending Brush: I'm aware that this is an eye brush, but I actually use this to blend out my concealer on my face, because it does such a nice job of it. It is soft and loosely packed, and extremely flexible. 3. Setting Brush: At least I think this is a setting brush. I use this to set the area under my eyes with powder, and also to apply highlight on the cheekbones. This blends and picks up product really well, but it might be a tiny bit scratchy. It's dense but flexible. 4. Tapered Foundation Brush: I used to use this for foundation, but it gave me too much coverage when I only need a light to medium coverage, so now this just sits in the kit waiting to be used. This is however a really good foundation brush, as it doesn't streak, feels super smooth and gets into the nooks and crannies well. 1. Flat Top Buffing Brush: This is the one I use for my foundation every single time, as it gives a good medium coverage and gently buffs the foundation into the skin, rather than letting it sit on top. It doesn't absorb a lot of product, which prevents wastage, thanks to the super densely packed bristles. It doesn't streak either. 2. 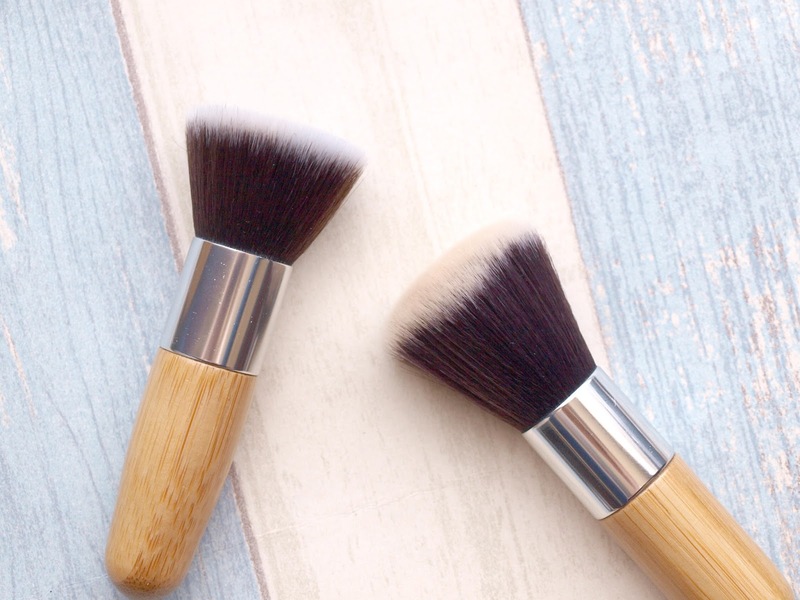 Flat Powder Brush: This one is good for buffing powder products into your skin, as it is soft, doesn't tug your skin, feels gentle and holds so much product. It isn't as dense as the other kabuki, which is good as it allows for ease of blending. My friend's MAC foundation stained this brush, and no amount of washing will get rid of it, which is very unusual for these brushes as a whole, as they're very stain-resistant. These brushes are also very durable, and I have washed them over twenty times with absolutely no shedding whatsoever. My partner reported a funky scent the day I got them, but after washing them the first time, they were fine. Some might have loose handles, as one did when I got it, but it was nothing a little superglue couldn't fix, and since then they have performed as well as day one, and I've had these brushes for well over 8 months. I highly recommend these brushes, and for roughly $1 per brush, this set is a steal. 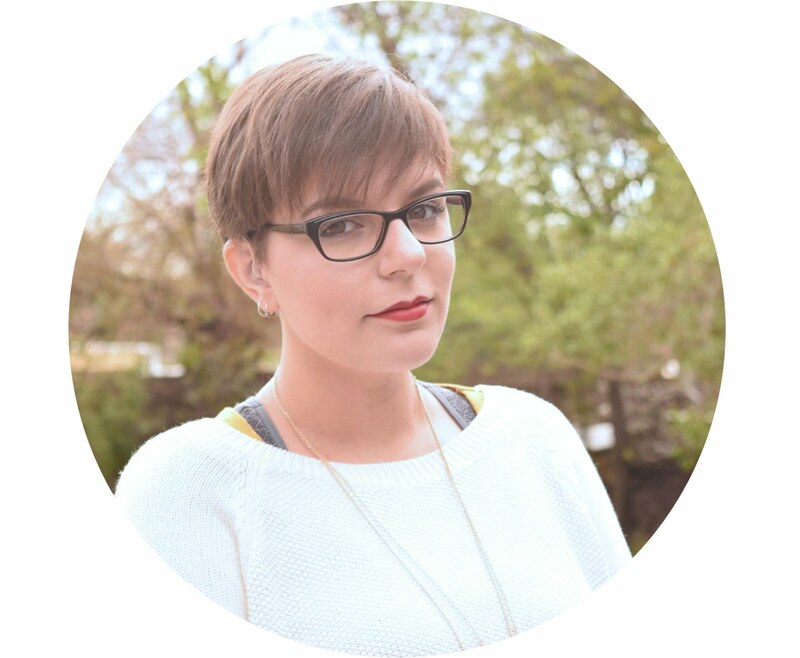 I don't think many people do, actually, and that's why I wrote this post. Thank you for commenting! Yeah, they're pretty damn amazing for the price, and if I like them more than EcoTools, then even better! You'll be able to find them really easily on eBay too, and shipping is usually always free too.